This space is just crying out for a blitz! That was the year I also did my PDC and with many wwoofing and permie adventures in between, its been a long journey back to where it all started: Frankston South! 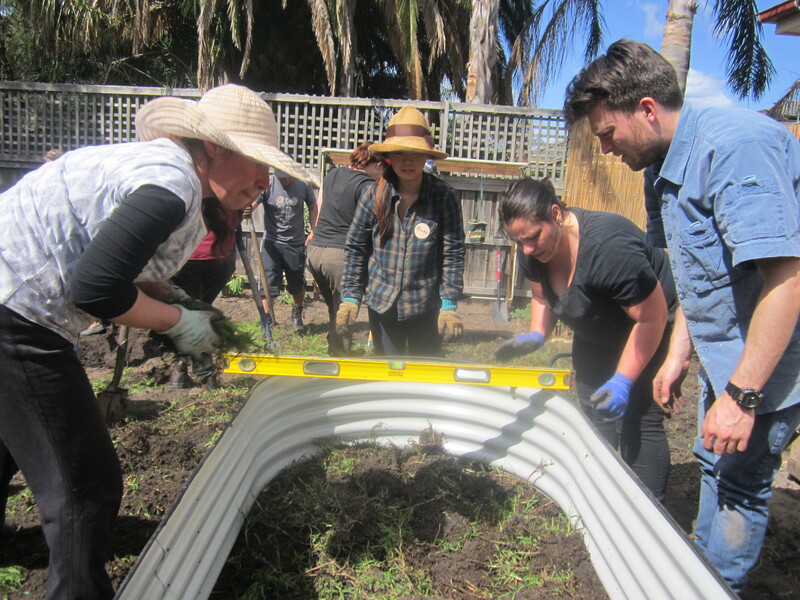 We lie between two bays and enjoy that beautiful Mediterranean climate which despite erring on the side of heatwaves and drought in the last decade, has recently blessed us with a rainy September to usher in our new Edible Backyard. And what a day we had for it! As the blitzers began to rock up and check out the site, the sun was beaming down. First meet and greets over, tools labelled and cups of tea downed we jumped into a few jobs to do while we waited for latecomers and the official opening circle at 11. These included the recurring love-to-hate blitz job of tearing yucky sticky tape off the cardboard pile and also saving some good humus-rich soil from being trampled on during the day, by moving it to the side. By the time we were done that, most everyone had arrived and we could start with our Welcome circle. In the course of sharing, we found we had a great mix of folk who hailed from as far away as U.S.A and Japan and as close as Frankston and Langwarrin (our neighbouring suburbs.) We also had a great mix of Youthfulness, from Ashling and Evelyn who are in Primary school, to Jack, a local from Baxter (5 mins away) who has lived in the area for 35 years, the last 10 of which he has been recording the monthly rainfall!! We found that an interest in d-i-y or rather d-i-t (together) food growing and building resilience was the common glue that had brought us all together. After a brief stretch and safety chat we had a look at the design and chat about the vision. Concepts like site analysis, sectors, zoning, relative location, water, soil, plant selection and lots more were discussed and after a bit of Q and A, it seemed folk had got the ‘gist’ of the vision they would be helping to transform the still mostly kikuyu lawn/blank canvas into. Integrate, not segregate is a great Permaculture principle. But sometimes you have to Divide and Conquer! Bend and stretch… reach for the sky! So we split up into job areas which for the morning included a huge group on ‘kikuyu removal’ aka grass bashing! 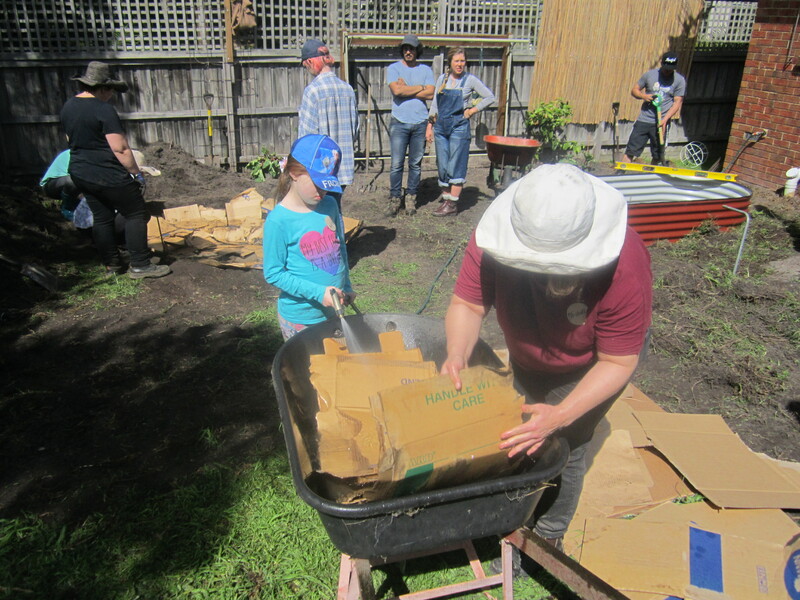 There was a group on pond digging and Ashling and Evelyn were tasked with painting up the chest of drawers which was now part of a chook shed. The blitzers attacked the lawn with gusto and in the warm mid morning sun the sweat was running before long. Whilst pulling it up, some sods were overturn and used to shape and level out the ground under the new raised beds. Another group was tasked with digging the drain, which had originally been planned as a swale. Our main considerations for lining it and making it a drain and not a swale (which are not lined, to let water trickle into recharge groud supplies) is that the ground immediately below the swale was not desirable to become really wet or boggy and also we wanted grey water to flow down a drain and not sit in a swale. Grass out, cardboard in! The cardboard was soaked in a barrow before being laid out to fit snugly on bumps and rises in the land. Already great chats were flowing and design tweaks and considerations were being taken on board such as putting something under the pond liner, (in our case cardboard, better to have old carpet) to prevent stones piercing it with the weight of water (Thanks Sharon!). There were probably at least a dozen great tips like that through the day and I can’t remember names to thank the participants, BUT THANKYOU ALL! That’s part of the beauty of a community event and a great example of the value of Integration over Segregation. The cardboard was down, beds levelled and before we knew it the call for lunch came out. Well as you’d expect the blitzers tucked into the amazing buffet lunch provided by hosts Noreen and Dave with a similar gusto as the lawn hacking! Thanks again Mum and Dad, it was a lunch to remember! As permie say: the problem is the solution. With quite a few people standing around, we had time for an inspection and chat about the wicking bed and a chat about the ‘Lasagna method’ of layering organic matter like soil, manure and straw and also rock dust in the beds for optimum soil structure and plant growth. We also had a chat about compost tea and inoculating bio-char, but decided Dan’s brew wasn’t quite ready based on the smell!! While all this was happening, a group was finishing the pond, fixing down the liner with rocks and putting a little scoria on the bottom. A small group also worked on making an edging between the new paths we had made and the section of lawn we were leaving as lawn, so it didn’t re-grow and take over the mulch. Some back-up wheelbarrows arrived (thanks Zein and Kev) and we got back to it! Mulch was brought in, beds were filled with soil and watered in and the wicking bed was begun. Thanks to my bro-in-law Will and his building skills the water level was set and bed sealed well. The flavor of the rest of the day was shovel-barrow-pour-spread! We got all the paths laid, beds filled and drain finished. We had 200L of rain water saved in a barrel to put in pond and fingers crossed for more rain to fill it naturally! We almost ran out of time before being able to have an essential chat of the day: Plant selection, forest gardening and companion planting. All super important things in Permie design and a successful and productive backyard. We looked at all the plants and managed to plant a few, notably the “berry and flowering border” and some green veg in the new raised beds. By this time some folk had left early and others were feeling the pull so we decided to do our closing circle. Many thanks were had and they included: To Noreen and Dave for hosting and a banquet! To everyone for showing up with such enthusiasm, energy and really great ideas. To Michelle for yarrow! To Naomi for amazing help with the design, organising the day, taking photos and general awesomeness. To Ashling and Evelyn for the best looking chook house I’ve maybe ever seen! And a big thanks to Permablitz for the concept, the support and the means through your network to make the dream come true! I’ll link this article to as many 185-ers as I can and hope to link in with follow-ups, especially late-summer/autumn (harvest time – come back and eat with us!) and in future seasons. Thanks again everyone – we did it! 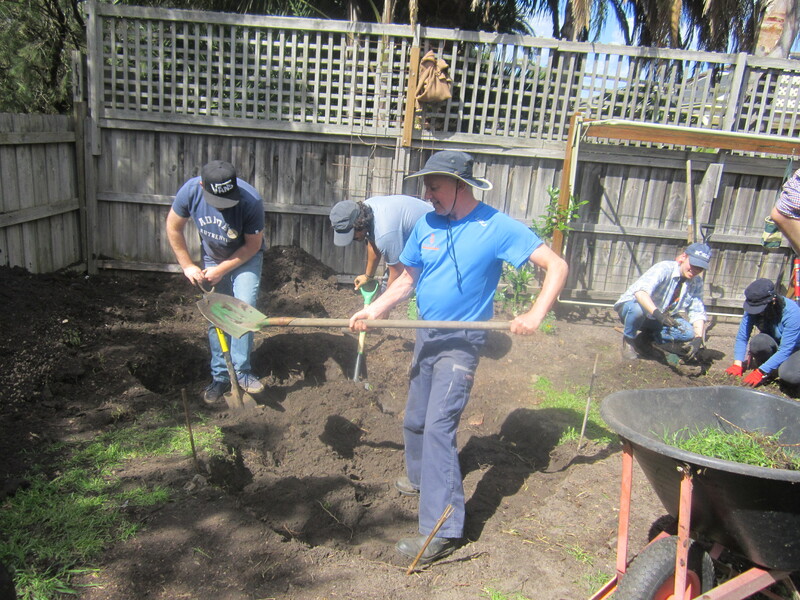 There’s lots more to do and as I said on the day – See you at the next one, we’ll get there, one backyard at a time!! Photos by Naomi Smith. See the full gallery here!